Clear skies. Low 62F. Winds light and variable..
Clear skies. Low 62F. Winds light and variable. 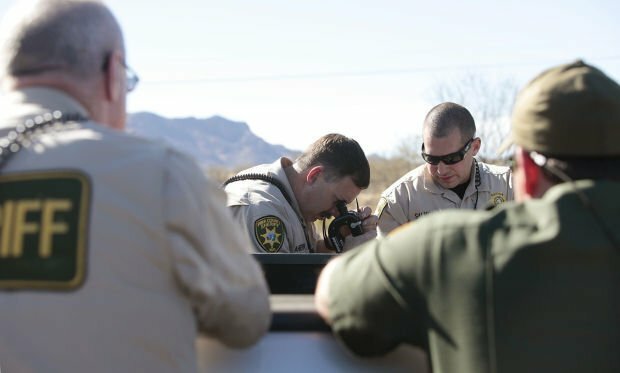 Deputy Gerald Ahern, left, peers into the gas tank of a suspicious vehicle pulled over by a sheriff’s unit working with the Border Patrol. On Sept. 4, the Board of Supervisors voted to end the Pima County Sheriff’s Department involvement in Operation Stonegarden. This vote was despite evidence of the sustained public safety value of the program and letters of support from every law enforcement agency head in the county. This was clearly politically motivated decision. Supervisor Steve Christy courageously dissented. County Administrator Chuck Huckelberry recommended approving the grant to the board. Operation Stonegarden funding provided the Sheriff’s Department the ability to deploy personnel, on federally funded overtime, into underserved and remote areas of our county. We lack the resources to do so on a regular basis. Drug and human traffickers traditionally exploit these areas. Transnational crime threats coming into our county through the porous border is a threat to all of us. The presence of personnel on Stonegarden operations helped interdict and, importantly, act as a deterrent to these criminal elements. Moreover, our personnel saved the lives of dozens of migrants in distress because of harsh environment. Due to our proximity to the international border, our county is a drug-trafficking corridor. Some estimates indicate that 40 percent of the drugs that enter the country will come through Pima County. The opioid crisis is a public health emergency. Reducing our ability to interdict drugs here may well have a cascading affect nationally by increasing addiction and overdoses. A simple seizure of a dozen fentanyl pills may well save several lives. We also know there is collateral violence associated with the drug trade that is a major concern. It appears the board believes that Operation Stonegarden is a federal immigration enforcement program. This is false. Sheriff’s Department personnel have no authority to enforce federal immigration laws. Further, we have made clear that doing so is not our role or responsibility. However, when we have reason to believe someone may be in this country without proper documentation we cooperate with the federal authorities. This should be expected and is consistent with the practices of most law enforcement agencies. The Board seems to believe that rejection of Stonegarden funding shows displeasure of immigration practices and policies coming out of Washington DC. How does the rejection of a local public safety grant achieve that? This is nonsensical beyond my comprehension. We can be quite certain the president has not been given pause by the action of the Pima County Board of Supervisors. I do, in fact, share some of the concerns about the policies, practices and rhetoric coming out of DC regarding immigration. This is not the way to address them. We have been working with the ACLU, community groups and others to craft policies, revise practices and increase transparency associated with Stonegarden. Great progress was being made to engage the community and resolve issues. We were moving forward in a manner that could be a model for other communities addressing controversial issues. Instead of embracing progress and moving forward, the board elected to bend to politics. Nothing about the vote by the board changes my mandate, and statutory authority, as the sheriff of Pima County to maintain public safety and address transnational crime. Nothing about this vote will change current policies/practices with respect to our appropriate interaction with federal law enforcement partners. The board has the luxury of making political, partisan and ideologically driven decisions we do not. Public safety is not a political, partisan or ideological issue; it is a quality of life issue. We must continue to address drug and human trafficking. We have an affirmative responsibility to attack transnational crime, and while staying within our respective lanes, cooperate with our federal partners. Unfortunately, we now will not have the benefit of federal funding. The board’s rejection of Stonegarden funding in the current year is a misguided political mistake. Worse, they have jeopardized millions in future federal funds that could have been used to purchase equipment and enhance law enforcement presence. Over the past 12 years, we have received $16 million in Stonegarden federal funding without opposition from the Board. Six million dollars of that purchased critical public safety equipment. Underpinning this vote is an unfortunate veiled assertion: that somehow the plight of the undocumented and the mission of public safety is better served when our local law enforcement professionals are not out there. This is offensive. The brave men and women of the Sheriff’s Department serve us with honor and distinction. The board should show support of these personnel, embrace progress on contentious issues, remove politics from public safety policy and restore Stonegarden funding. While not the politically expedient thing to do, it is the right thing to do. Mark Napier is the Pima County sheriff. Tucson police identified the man struck and killed by a vehicle as he attempted to cross a midtown street in a wheelchair Wednesday evening. Pima County Sheriff Napier tells Fox & Friends loss of border funds "unthinkable"